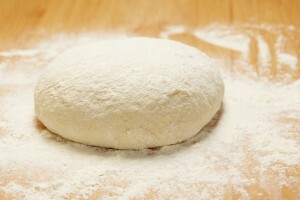 Unbaked bread dough can be dangerous when ingested by dogs and cats. When ingested, the unbaked bread dough expands in the warm, moist environment of the stomach and can result in a bloated or distended stomach. Less commonly this can progress to twisting of the stomach also known as gastric-dilatation volvulus (GDV) or bloat. Signs of bloat or GDV include vomiting, non-productive retching, a distended stomach, an elevated heart rate, weakness, collapse, and death. Additionally, when the yeast use sugars in the unbaked dough (a process called fermentation), they produce carbon dioxide gas and alcohol. The carbon dioxide gas is what makes bread rise. Alcohol from the fermenting yeast is rapidly absorbed into the bloodstream and results in alcohol poisoning. Ingestion of alcohol can cause dangerous drops in blood sugar, blood pressure, and body temperature. Severely intoxicated animals can potentially experience seizures and respiratory failure.